The march started from the Bo tree at the Pettah Junction at 10:30 a.m. and went to the Presidential Secretariat for handing over the letter to the President, but she was not in the secretariat at that time. Then the marchers met former Prime Minister and Peoples’ Alliance parliamentarian, Mr. Rathnasiri Wickremanayake, and handed over that letter to deliver to President Kumaratunga. The PNM’s leading monks, Ven. 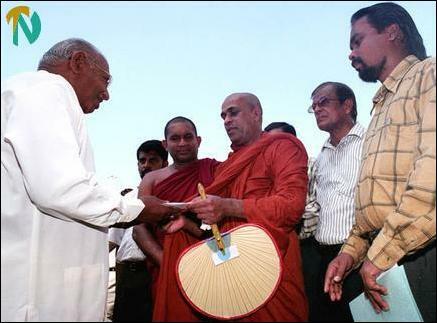 Elle Gunawansa thera, Ven. Dabera Amila thera, JVP parliamentarian Mr. Wimal Weerawansa, former Sri Lankan cricket captain and PA parliamentarian, Mr. Arjuna Ranatunga, and other PNM leaders marched under the PNM banner. 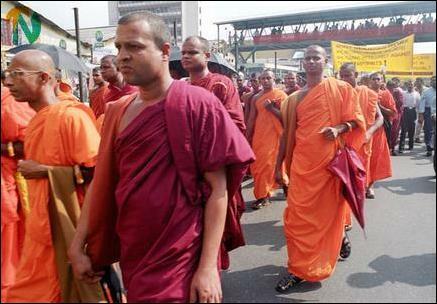 Several Buddhist monks and thousands of PNM supporters participated in the demonstration. 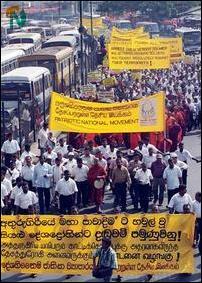 The demonstrators carried banners and placards shouted slogans and that the PM should be arrested immediately. Ven. Elle Gunawansa Thera hands over a letter to the former Prime Minister and PA parliamentarian, Mr. Rathnasiri Wickremanayake. At extreme right is JVP propaganda secretary, Mr. Wimal Weerawansa.